The REUK 2013 Solar Water Heating Pump Controller (pictured above) is one of the most popular products on the REUK.co.uk website. With a temperature sensor on the solar water heating panel, and a second on the hot water tank, this controller decides when to turn the pump on to circulate solar heated water from the panel to the tank. This controller is based around a PICAXE-08M2 microcontroller which gives a good balance of programmability and simplicity. It does however have one large disadvantage – it can only do integer arithmetic, i.e. performing operations on whole numbers only. Therefore when we come to make modifications to the controller for particular customer requirements – e.g. frost protection and maximum temperature shut offs etc – things get unnecessarily complicated. Additionally there is limited memory on a PICAXE-08M2 which becomes a serious problem as the complexity of the desired programming increases. For this reason we are currently porting a lot of our PICAXE based controllers to Arduino which allows floating point arithmetic and far more memory space. 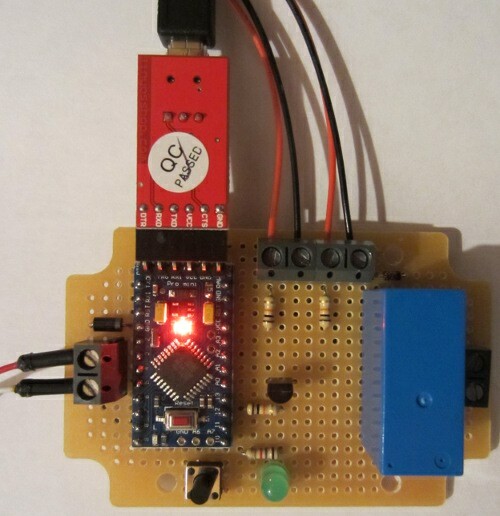 Pictured below is our latest Arduino solar water heating pump controller. It is functionally identical to the standard 2013 PICAXE controller, but offers much more flexibility for modifications and added features. The Arduino board used here is the Pro Mini – the smallest of the Arduino range. 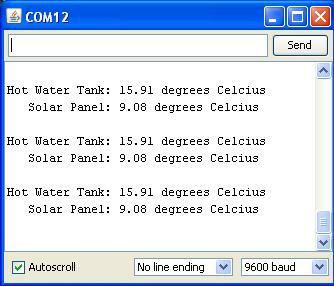 The red board plugged on to the blue Arduino board in the above photograph is used to connect the Arduino to a PC via USB for programming and/or so that data can be outputted to a serial monitor in real time or for later analysis as shown below where the temperature of the solar panel and of the hot water tank is outputted once every second. 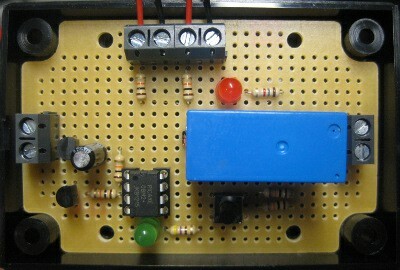 If monitoring is not required then this break out board can be removed. If you have any particular requirements for a solar water heating pump controller which are not met by our standard controller range, email neil@reuk.co.uk with details of what you need. If you are interested in building and programming your own solar water heating pump controller as a project, click here for our simple Arduino Solar Water Heating Pump Controller Design and Code which should help you get started.